Burns your throat as well as your face! 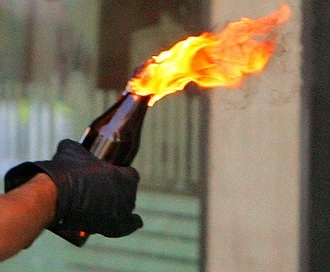 AKA petrol bomb or people's grenade, a simple Improvised Weapon for all your asymmetric warfare needs. Brilliant in its simplicity: a glass bottle full of gasoline (or very high-proof alcohol, and even turpentine in some cases), and a burning rag on the bottleneck, thrown at the enemy. The bottle breaks on impact and spreads its flammable contents, the still-burning rag hits the liquid, and presto, your target's on fire. The Molotov cocktail is named for Vyacheslav Molotov, the Soviet foreign minister who is historically infamous for signing a clandestine non-aggression pact with Nazi Germany in 1939; when Finland (which had been ceded to the Soviets under the Molotov-Ribbentrop Pact) began to suffer Soviet bombing runs at the start of the Winter War, Molotov claimed they were not 'bombs', but food and supply drops, causing the Finnish soldiers to facetiously dub their hand-made petrol explosives 'Molotov cocktails'. In Video Games, the effect of the heat is usually ignored. May be shown to be a bottle of alcohol with a flaming handkerchief stuffed inside. It's also common to be an Improvised Weapon by raiding a local bar or liquor cabinet. But it should be noted that only the highest proof drinks would be of any effectiveness. So actual cocktail drinks wouldn't work, only harder alcohol like vodka or rum (and these will only bring grief to the most lightly clothed of foes). For the self-propelled, upscaled version, see Molotov Truck. Popular in guerrilla warfare and riots. Common way to Kill It with Fire. For a person who uses this and other handheld explosives or incendiaries as a Weapon of Choice, see Throw Down the Bomblet. Maria Louise from Mobile Fighter G Gundam uses one to destroy a cornerpost that supports a energy barrier, to help her allies come help Domon. Durarara!! : In the flashback to Masaomi's time with the Yellow Scarves, Walker saves Masaomi's girlfriend from the Blue Squares with two bottles of gasoline, one used as a molotov. In YuYu Hakusho, an arsonist burns down Yusuke's home with one. In Bleach, Mizuiro Kojima uses one of these against Aizen during the Fake Karakura Town arc. In the Highschool AU of Fairy Tail, Natsu uses this instead. In chapter "The Land of Do-As-You-Please" of V for Vendetta as the goverment loses its grip on power, we see people preparing petrol bombs while raging about the Finger executing looters. We see some of these used during the riots towards the end of Transmetropolitan. An angry mob uses them while attempting to storm Shadow Hill during the "Confession" arc in Astro City. Savage sees the British resistance use them on occasion. One guy wonders why his are ineffective when his buddy points out that he's made them with diesel instead. Jonah Hex: In "Weird Western Tales'' #31, the McCandless gang try to burn Jonah and the sheriff out of the sheriff's house with a barrage of kerosene bombs. Jonah and sheriff turn the tables of them, first of all by shooting the bottles while the gang members are holding them, and them flinging some of the remaining bombs at other gang members and shooting them while they are in the air. Hack/Slash: In Hatchet/Slash, Cassie uses a Molotov cocktail to set fire to slasher Vincent Crowley in an attempt to Kill It with Fire. The Maze Agency: In "The Return of Jack the Ripper...? ", the killer uses a petrol bomb as a distraction when they attempt to kill Gabe. Goliath uses a couple on Ecoban soldiers in Sky Blue. A man uses one against a War Machine in a flashback sequence in 9. It fails and he dies in a just offscreen hail of machine gun bullets. Molotovs are the weapon of choice for rioters in the Jin-Roh: The Wolf Brigade series, with the plot of the movie kicking off when the main character hesitates in shooting a schoolgirl who was smuggling some to a protest. In The Simpsons Movie, Barney tries to throw one of these at Moe, but he catches it and hurls it back at him. In Hostage, Mars uses numerous of these to take down the mansion with him. In Escape from New York, a cabbie lights a Molotov and throws it at approaching Crazies. It explodes in front of them, stopping them. In the 1966 movie about World War II Is Paris Burning?, Frédéric Joliot-Curie makes some Molotov cocktails for the French Resistance. Like a good physicist, he uses gasoline, not alcohol. In the Watchmen movie, a protester in the '77 riots throws a Molotov at Archie, and Comedian jumps down and starts shooting people. In October Sky the protagonist uses a Molotov to torch his launch site after being arrested for starting a forest fire. Poignant since he only had the alcohol to make rocket fuel in the first place. Selena from 28 Days Later fights off the infected with Molotovs. In 1408 John Cusack throws a Molotov (alcohol version) across the hotel room he's in to finally "kill" the room after remembering seeing this graffiti on the wall: "Burn Me Alive". One of these was made in Shaun of the Dead... and its wielder was incapacitated before he could even try to use it. John J. Macreedy improvises one during the final fight in Bad Day at Black Rock, using his tie as the fuse. In Dogma Serendipity starts to make a Molotov Cocktail when they are being attacked by the Golgothan. She ends up not needing to use it. In Critters Charlie uses this to destroy the Crite's spaceship. The title character in Mikey does this to kill his dad and burn down the house after turning on all the gas in the house. The prisoners in Brute Force use it to attack the guards in order to escape. The eventual use of the 'fire' in Sucker Punch. In the Korean film The Host, one character has a whole bag of Molotov Cocktails, using one cocktail to light the next. Sudden Impact starts with Harry Callahan in his car being pursued by armed thugs. At one point they throw a molotov into his car, but he manages to throw it back at them. In A Bronx Tale, C's friends attack a store in a black neighborhood with molotov cocktails. As they drive off, one of the black residents picks up one of the bottles and throws it at their car. It ignites the rest of the bottles they had brought, and they get incinerated. Used in the climatic chase scene in The Roadwarrior. Despite initial success against their pursuers, the disabled mechanic drops one and sets himself on fire. Although he's protected by his leather gauntlets and eventually puts the fire out, another character is killed coming to his aid, and the mechanic is killed trying to retrieve her body. In The Darkest Hour, a few characters use these to drive the aliens back. In A View to a Kill, Max Zorin sets fire to the San Francisco City Hall by using molotov cocktails everywhere. In The Warriors The Warriors use one to blow up a car to ward away an opposing gang. In 10 Cloverfield Lane, Michelle uses one to take down an alien ship that is trying to kill her. Red Hill: In flashback, Old Bill is seen using one to set fire to Jimmy's home as they attempt a Fiery Cover Up. Mildred uses several to firebomb the police station in Three Billboards Outside Ebbing, Missouri. In Night of the Living Dead (1968), Harry tosses Molotov cocktails to clear a path to the truck when Ben and Tom make a break for it. Jessica uses a Molotov cocktail to light up 'the Beast' after she tricks Sunny into driving into a pit in Fair Game. Murphy's War (1971). The title character constructs a larger version of this trope as aircraft bombs in a failed attempt to destroy the U-Boat. In Rhymes For Young Ghouls, Joseph uses a Molotov cocktail to destroy the car his wife was driving when she ran over their son. In Deathworld 2, Jason uses these, except that this is far in the future and they are known as 'molotails'. The technothriller novel Vortex by Larry Bond features South African partisans fighting against a Soviet-backed invasion with souped-up Molotov Cocktails using soap flakes to convert the gasoline into a sticky napalm-like substance. Shows up in Night Watch by Terry Pratchett: after Vimes and some of his men search the Secret Police headquarters, they put a couple Molotov cocktails through the windows of the building. In Dragon Queen, the old man uses one of these to burn down a tavern. Steal This Book and Freedom Fighters Guide, the former a guide for the counterculture, the latter a CIA-funded pamphlet both feature directions to how to create and use Molotov cocktails. The Timeline-191 Alternate History series by Harry Turtledove has them called Featherston Fizzes, named after the Confederate Hitler analogue Jake Featherston, as they're first used by Confederate resistance fighters in parts of the CSA occupied by the USA after World War I. Used here and there in The Tomorrow Series, essentially a story about a gang of geurilla fighters. Cocktails are mentioned as being used whenever the group needs some Stuff Blowing Up. Mavis in The Eye of the Pyramid refers to George Dorn to as someone who jacks off to a diagram of a molotov cocktail. Parker uses a Molotov cocktail to firebomb a gas station to create a distraction for a bank robbery at the start of Flashfire. Young Sherlock Holmes: In Death Cloud, the thug Clem uses oil lanterns as makeshift Molotov cocktails. He uses one to burn down the warehouse, and another when he attempts to torch Matty's narrowboat (with Matty and Sherlock on board). Fittingly, Sherlock uses one at the end of the novel to trigger a dust explosion in the fort. In Swarm on the Somme, they're known as "Teddy Tonics" or "Roosevelt Rums", due to first being devised by Teddy Roosevelt to use against the Grex invasion in California. Buffy the Vampire Slayer episode "Passion", used as the opening gambit in Giles's Roaring Rampage of Revenge against Angelus. The games also have them, except it's living hellfire. Faith comments on whether they come in six pack. Due South episode "Gift of the Wheelman." Third Watch episode "Spanking the Monkey." A pyromaniac throws a Molotov into a nightclub. Burn Notice had Fiona use these to ward off thugs in the third episode. She needed some type of weapon and improvised with a liquor cabinet. In the original miniseries V (1983), little old Ruby throws a Molotov into a Visitor craft, saying, "This one's for Abraham," her friend whom the Visitors killed. In the season 1 finale of Lost, Michael's raft is blown up by a Molotov. We don't know the name of the Other who threw it, so she is known on Lostpedia as "Molotov Woman." MythBusters used one of these on a ship to conclude the busted "Archimedes Death Ray" and proved that the cocktail can still be a dud if it isn't given proper conditions to spread out. It required a second cocktail and a strong wind to be effective. Randy's house in The Wire got torched by two thugs armed with Molotovs after he had told the police details about a gang killing. In The Young Ones, Vyvyan uses one of these to shut Rik and Neil up. Vyvyan: It's funny, but being ill makes me lose my usual tolerant and easygoing approach to communal living (lobs it across the landing, into the other's bedroom). Used in Seven Periods With Mr Gormsby, not literally but in a memorable scene when Steve asks Mr Gormsby, "Did you teach 5F to make Molotov cocktails?" Gormsby replies, "Of course! How else can they fully understand the Russian Revolution?" In Deadliest Warrior, this was one of the weapons selected to represent The Mafia in the Mafia vs Yakuza episode. The tests showed it capable of engulfing a car in flames within seconds, though it proved to be ineffective in the actual five on five battle, garnering only two kills out of a thousand computer simulations. In the Doctor Who serial "The Seeds of Doom", Scorby creates some Molotov cocktails to use against the Kyrnoid, a Man-Eating Plant. In the episode "Burning House of Love" of True Blood, three rednecks use molotovs to torch the house where three vampires are resting for the day. The episode "Swan Song" of Supernatural had Castiel use a Holy Fire Molotov to torch Michael. Lucifer however was not pleased with this. Review With Myles Barlow: In the episode where Myles roadtests acceptance by joining a biker gang, he uses a Molotov cocktail to burn down the headquarters of a rival gang. Xena: Warrior Princess: Xena invents the Molotov cocktail in the episode "Warrior...Princess". In the Monk episode "Mr. Monk Meets the Godfather," after talking with a rival gang (asian in origin) on a tip from a U.S. Mint employee. Monk sits down in exhaustion when he tried to get the gang leader to settle for 100 pushups but failed. Then a molotov cocktail is thrown inside the gym and the gang is forced to evacuate alongside Monk and Sharona. Monk is later blamed by this by the FBI agent in charge of the investigation. Jim Rockford of The Rockford Files once used a Molotov cocktail to torch the Criminal of the Week's getaway car. Justified: Boyd uses one to torch a meth lab in "Hammer". In "Painting on Loan", Jerry and Brain throw a Molotov cocktail while experimenting to work how a fire might have been started. Jerry comments on how he has always wanted to do this. Murdoch Mysteries: The killer uses one to start a fire in the brothel as a distraction while he commits a murder in "The Green Muse". The Musketeers: In an episode, Athos and Aramis takes refuge from assassins that are after the queen in a monastery. The nuns living there brew strong spirits for a living, and during the assault they uses them in bottles as makeshift grenades (as well as a beehive). Vera: Used as a murder weapon in "The Ghost Position" where the killer throws three petrol bombs into a house. Motive: One is used to torch Angie's precious car in "Frampton Comes Alive". The Good Place: In a flashback in Season One's "Jason Mendoza", Jason uses one to torch DJ Acidcat's speedboat. He uses this skill again to help the gang out of a jam at the end of Season Two. Midsomer Murders: In "Left for Dead", the murderer attempts to kill one victim by firebombing her house with a Molotov cocktail. The attempt fails, but only just, and the victim is hospitalized. The Coup "Pork and Beef"
Also, the album cover for Party Music features a different kind of Molotov Cocktail, as seen above. Chumbawamba's "Rebel Code" as per the liner notes, is about "Two revolutionary inventions from Finland ... the molotov cocktail and the Linux computer operating system" and "It must be the cold weather. or the Vodka." Changing everything that they were taught: alcohol and fire and ones and naughts. Something in the water and the bones — rebel code. The Offspring's song "Hand Grenades" is about these, going so far as to have the lyrics describe how to make one. Let's make hand grenades, hours of fun in a little jar! Let's make hand grenades, try one out on your neighbor's car! You thought I was a write-off, you better think again. They appear in Psionics: The Next Stage in Human Evolution as a throwing weapon and cause lingering fire damage, in addition to the initial explosion. They get their own special rules in GURPS. They're very powerful for improvised weapons but also extremely unreliable. Dungeons & Dragons has bottles of Alchemist's Fire, which ignites upon being exposed to air. In Paranoia, Bouncy Bubble Beverage cans explode if you shake them hard enough, which comes in handy if you don't have clearance to use real grenades. Project Zomboid: One of the weapons you can craft in the game. In Myth - The Fallen Lords, dwarves throw these. They make excellent weapons against the slow-moving Thrall (undead warriors), as well as can set off other explosives. However, they are unreliable, especially in rain or snow, do friendly fire, have a tendency to bounce off things and sometimes roll back towards the thrower, and are generally affected by the detailed physics, so may be unexpectedly tossed in a new direction - sometimes very strongly - by other explosions nearby, before blowing up. They aren't exactly molotovs, being explosive but not setting things on fire and often referenced as being filled with powder. Resident Evil 0 features them, as fire is the best way to deal with the Leech Zombies. Later on, Napalm Grenades serve the same function in a more efficient manner. Resident Evil 5 has Majinis that use Molotov Cocktails. Similarly, the Ganados used them in Resident Evil 4. If you find Alcohol Bottles, Newspapers, and Lighters in a scenario, these can be created in Resident Evil Outbreak. Similarly, in Resident Evil: Revelations 2, you can craft them with a bottle and some alcohol. Strangely, the game calls them "firebomb bottles". In the Left 4 Dead games, molotovs are a monster of many bites since zombies are Made of Incendium. When they hit the ground, they create a massive pool of flame that can stop horde rushes dead in their tracks (common infected are instantly killed), can flush out those pesky specials, and slow downnote except in the first game's Campaign mode, where the tank speeds up and eventually kill both witches and tanks. The protagonist in Gun can use "whiskey bombs," which are basically whiskey bottles with flaming bits of rag in the tops. Given that you also drink whiskey to regain health, it's a bit worrisome. Grand Theft Auto likes Molotovs too. In Grand Theft Auto 2, however, Molotovs somehow function more like a grenade but with a (presumably) much shorter time fuse compared to the actual version. The former is far more popular with players compared to the latter for this reason. Grand Theft Auto: San Andreas features a mission where you have to torch a house with Molotovs (and then battle your own flames, to save a girl you trapped inside without knowing she was in there). Later on in the game, pedestrians riot and throw molotovs around, including at you. However, outside of said mission and the riot mode at the last legs of the game, Molotovs are only in three or four spots across the entire state map. Grand Theft Auto: Chinatown Wars allows you to make your own. As is typical of the game, Grand Theft Auto IV takes a more realistic (but less fun) approach to them than previous installments. The actual fire caused by the weapon is generally contained to a pretty small area, and you have to get more or less a direct hit in order to effectively light a person or vehicle. The Saints Row games all feature them as a throwable weapon. The throwing range, area of affect, and damage are usually upgradable. As with the GTA example above, once the player unlocks the ability to be fireproof, they can be used very effectively with little risk. The Goonies II video game had these as one of your character's weapons. In Call of Duty: World at War, the Russians' secondary grenade weapons are these. They're pretty pretty damn effective too. They are also available in multiplayer. But their slow travel speed after throwing, exploding on impact (thus, you usually need to you to expose yourself to make sure you can hit something with them, while frag grenades can be instead cooked and thrown around corners with less risk), generally only killing with a near-direct hit - makes them unpopular there. Black Ops used this in the Vorkuta mission in the campaign. Its sequel has them as an optional weapon in Mission 4. Command & Conquer Generals, the GLA has the unit "Angry Mob," which is initially equipped with pistols and rocks, but can be upgraded to wield AK's and Molotovs. Effective against buildings. In Red Alert 3, Russian Conscripts can switch between AK's and Molotovs to alternate between anti-infantry and anti-garrison warfare. Max Payne uses Molotovs on many an occasion. Red Faction allows the player to unscrew the fuel tank for the flamethrower and use it as a makeshift Molotov. A staple in Worms, useful for creating flaming pits of death. Their flames are unique in that barring worm damage, their flames stay between turns instead of burning out in a matter of seconds, ensuring the pit stays flaming for a good while. In Final Fantasy VII, the Molotov item deals fire damage. Molotov Cocktail is Dyne's enemy ability in Final Fantasy VII, an enemy ability in Final Fantasy Record Keeper, a throw ability in Pictlogica Final Fantasy, and an agility ability in Final Fantasy Airborne Brigade. In Final Fantasy Tactics Advance/A2, the Juggler job can throw Molotov cocktails as an attack, which deals a small amount of fire damage and has a chance of driving the target berserk. Alone in the Dark (2008) emphasizes improvised fire-based weapons, like aerosol can flamethrowers and Molotovs. The Molotovs in Freedom Fighters are often better than the grenades: they're a guaranteed kill and the enemy doesn't have a chance to run away. A little known game called Iron Grip: Warlord used them as weapons. The heat flare was spectacular. And the damage dealt was usually a one-shot kill. The Godfather: The Game has them. Notable in that if you decide not to use them, you put bottle back inside your Hammerspace shirt. While the rag is still on fire. In Arcanum Molotovs are the first item that can be made by the explosives discipline and are, unless you cross-train with electricity, the only damaging explosive until the end of the tree. In Metal Slug, Molotovs can be picked up in certain stages under the alternate name "Fire Bomb". They often appear at oppurtune moments where you're about to run into several crowded groups of infantry. Possibly the most effective ones seen in a video game is Far Cry 2. If the wind is going when you throw one... your enemies will be greeted by a literal firewall, due to the fact that the game features very realistic fire propagation. In dry, grassy Savannah areas, they're great, but in lush jungle areas, or immediately after rainfall they're next to useless. Good as a distraction, while you sneak somewhere since the enemy AI is programmed to respond to fire as a greater immediate threat than you are. And again in Far Cry 3 and Far Cry 4. There's even a class of enemy Mooks that specialize in Molotov throwing and are set alight when you shoot them in the chest. In Metal Gear Solid 4: Guns of the Patriots, Snake can acquire these (although they are referenced by their more technical name, "petrol bomb"), mostly during Act 1. While you can also obtain and use standard incendiary grenades, which have more power, Molotovs trade the power for increased range, although damaging explosives in general seem useless in the game in harder difficulties. C-dogs, the sequel to the freeware DOS game Cyberdogs by Ronny Wester, has Molotovs as a selectable weapon. They cannot bounce, but the flames that spread will do incredible damage to anything that they touch. Raz: Hey, is that milk regular kind, or the exploding dream kind? Boyd: It's fortified with what the world wants! What the world deserves! So, yes, they are indeed the kind that explode. BioShock has an enemy, the Nitro Splicers, who throw either Molotov cocktails or tin can bombs depending on where you encounter them. You can also make your own by using the Incinerate plasmid on a bottle of alcohol and then Telekinesis to throw it at an enemy. Molotov cocktails appear in the Fallout series as a type of grenade, subject to all the uselessness of that class of weapon. These were supposed to appear in Fallout 3 but due to engine limitations weren't implemented. Fallout: New Vegas reintroduces the Molotov as 'fire bombs' with the Honest Hearts add-on where they behave strangely; they don't explode on impact much like regular hand grenades, and apparently deal plasma damage, gooifying Mooks on death, instead of incinerating them with fire damage like they should. Fallout 4 brings them back where they serve as cheaper alternatives to grenades. Creating one of these using a paper bag and a bottle of hair tonic is part of the solution to the last puzzle in Leisure Suit Larry 2: Looking for Love (in Several Wrong Places). Just remember to be very careful with your syntax. Operator's Side, a.k.a Lifeline'': you need one to get past the first boss. But first, you have to find the ingredients for it... and, more importantly, suggest it to Rio during a cutscene conversation. Good luck pronouncing it in a way that the verbal recognition software understands! Red Dead Redemption calls them Fire Bottles. The Fan Prequel Space Quest: 0 had this as a solution to one of the puzzles. Towel, lighter, and half a bottle of Coldsaurian Brandy, an extremely strong, extremely disgusting liquor. In the first mission of Starcraft II Wings Of Liberty if you destroy all of the Dominion holo-boards the prisoners you release will revolt with these as their weapon of choice. Their Molotov cocktails are extremely effective against buildings. In WarCraft 2, the self-destruct icon for the goblin sapper unit depicts a lit Molotov. Zeke, a kind of a Mook in Batman Doom who looks like a fat trucker with a big beard, uses these. The Molotovs they throw are actually pretty harmless due to their short range - as long as you keep your distance and don't walk into a fresh Molotov still burning on the ground (they disappear after about a second), you're home free. One of the weapons available in Odium. They work similarly to grenades though they do less damage, but more than make up for it by setting your opponent on fire for three turns. One of the soldier's default abilities in Brink, it's mainly used for knocking over groups of enemies. Usable in a weapon in Jagged Alliance 2; high-proof alcohol is sold in any number of bars, and rags are Commonplace Rare but comparatively easy to acquire (knife + t-shirt). They make for very effective area-denial weapons, particularly as the explosion is roughly comparable to that of a mini-grenade, and the flaming puddle burns for four or five turns straight. The Holy Water in the Castlevania games operate in a very similar manner to Molotov cocktails, where, upon the holy water container breaking from the impact, it causes a fire. Counter-Strike: Global Offensive adds these to the series's grenade arsenal. It starts a fire that lasts about 10 seconds once it hits the the ground (and only the ground; it just bounces off walls), damaging and slowing down whoever walks through it. It's used mostly for the sake of area denial, but can be put out by a smoke grenade. The weapon is exclusive to the Terrorist side, but Counter-Terrorists have incendiary grenades that function identically. Humorously, despite just being the traditional glass bottle full of gasoline and a rag, it cost $400 (and used to be more than twice that). Appears in Postal 2, where it can be sometimes found in the hands of Al Qaeda-like terrorists. Medal of Honor: Underground has these as "Petrol Bombs". Mass Effect: Though you don't ever actually get to use it yourself, ryncol (the krogan liquor of choice) is apparently volatile enough that it will spontaneously combust on its own when thrown at something. In the Citadel DLC, Grunt sets fire to a C-Sec car with one. Then he steals the car (while it's still on fire, yes. He'd drunk some of it y'see). The Last of Us sees Joel crafting his own Molotov cocktails using, naturally, rags and alcohol. As a weapon, they're initially troublesome (flames will kill human enemies as well as Infected, but in the meantime they're on fire, and fire spreads) but work very well against Bloaters by burning away their fungal armor. Amusingly, Joel ignites the cocktails when he equips them, and will calmly stuff the lit bomb back into his pocket when putting them away. They can be crafted in The Forest by combining a bottle of booze and a piece of cloth. You can make them in Terraria, although you'll need to craft the other key components of it first (a torch for the light, silk for the rag that helps to bear the fire from the torch, brewed ale for the fuel, and glass for the containers). It is easily the strongest of the pre-Hardmode consumable weapons. In Dead Rising, Paul Carson is a psychopathic arsonist who has a seemingly infinite supply of these. When Frank defeats him, Paul drops a molotov on himself. If Frank chooses to save him with a fire extinguisher, Paul will pull a HeelFace Turn and give Frank his collection of molotovs. In Dead Rising 2, Chuck and Frank can make a molotov if they have whiskey and a newspaper. In Off the Record, the looters and the evil Chuck Greene will use them as weapons. In PAYDAY 2 these are a usable weapon introduced in the "The Butcher's BBQ Pack" DLC. Firebombs are some of the most common consumable items that the Hunter comes across in Bloodborne, providing an easy way to set ablaze the very flammable beasts that plague Yharnam. They also come in a variety that is designed to be thrown backwards over the shoulder to give pursuing opponents a nasty surprise. Weirdly, they're actually called Molotov Cocktails despite the game's fictional setting. Molotovs are the grenades of choice in Darkwood, capable of setting up a wall of flames for area denial, kill most creatures on a direct hit from burn damage, or just destroying furniture and doors blocking your way. They can be crafted with gasoline or alcohol. Grim Dawn: Called Blackwater Cocktails, they're available to Demolitionists at an early level. They have a very good line of upgrades, boosting them with extra potency, Hellfire and weakening enemies due to sheer dint of burning, adding up to each cocktail being a little pack of pure Hell that not only does heavy damage, but softens creatures a lot for even heavier ordnance. In Yakuza: Dead Souls, molotov cockails can be found in SDF supply caches or bought from vendors. The pool of flames will ignite and kill basic zombies, but tougher enemies may shrug it off. Certain zombies carry molotov cocktails to throw at the player. If shot while winding up, they'll drop the grenade and potentially set other zombies on fire. In Bloons Tower Defense 6, Gwendolin's level 3 ability, called "Cocktail of Fire" is this. Adventure Time "Bad Timing": An angry Lumpy Space Princess throws a root-beer Molotov through a window of Bubblegum's castle. LSP then pulls the brakes out of a nearby fuel tanker and sends it hurtling towards the castle doors for an almighty explosion. Molotov Cocktease from The Venture Bros. is a reference to the projectile. Brock is also seen throwing a molotov in a flashback. But, being Brock, he uses an entire can of gasoline. The IRA activist isn't shown on UK broadcasts of that episode, probably because of a mixture of Dude, Not Funny! and Too Soon. In another episode, Bart and Homer make use of the fact that everything in the Simpsonverse is Made of Explodium by making molotov cocktails out of coconuts. First introduced to Europe during the Spanish Civil War of 1936-39, it also saw use in the '37-45 Second Sino-Japanese War. It was a weapon of desperation, used by poorly-equipped infantry against armoured cars and tanks (in urban combat, such as at Shanghai and Changsha). These received a definitive name in the 1940 'Winter War' between Finland and the Soviet Union. See, the Soviets had been bombing Finnish cities, but Soviet Foreign Minister Vyacheslav Molotov insisted that the USSR was just airdropping "food aid" to the starving Finns. The Finns, in a fit of Gallows Humor, started calling the bombs "Molotov bread-baskets", and then started calling the glass firebombs they lobbed at the Soviet ground forces "Molotov cocktails"—"a drink to go with the meal!" Significantly, the Finnish Molotov cocktails were originally filled with high-proof denatured alcohol manufactured by the state liquor monopoly Alko (which still exists), and were equipped with a slow match bound to the outside rather than a burning rag for more reliable ignition. They were primarily utilized by throwing them at Soviet tanks' exhaust ports, forcing the crew to evacuate from the noxious fumes filling up their vehicle... well, aside from the reportedly rare times the flaming mixture managed to cook off the main gun's ammunition. While the Finns would continue to use them throughout World War II, these weapons were also used by their adversaries, the Red Army and Soviet Partisans, against the Germans and their allies. The Polish Home Army would also utilize them against the occupying Germans. Note that these weapons are generally useless on most modern Main Battle Tanks, which are designed to keep flaming liquids from seeping into critical spaces. This goes double for the American M1 Abrams, whose gas-turbine enginenote of the kind supposed to be used in aircraft - it makes the vehicle an impossible-to-miss target for heat-seeking air-to-ground missiles, though this hasn't been a real worry for the US since the fall of the Soviet Union. It can also run on virtually any fuel, including JP-8 (the US military's standard fuel, similar to standard commercial jet fuel, but used to power everything from diesel jeeps to fighter jets), which is why it was chosen (access to fuel has long been a problem for armored units; the M1, with its ability to run on practically anything, avoids this issue to a large extent). runs so hot already that a Molotov wouldn't affect it. Light tanks and Armoured Personnel Carriers are not universally indifferent to their charms, however. Note that one is effectively forcing the tank-commander to choose between killing the engine, potentially allowing you to bring something bigger (like an anti-tank rocket-launcher) to bear on the vehicle's weak spots and disable/destroy it, or to retreat and risk engine failure. Even though tanks never operate alone, the latter is still a safer bet in most cases. Even if the molotov cocktail poses little direct threat to a buttoned-up tank, the presence of them on the battlefield could force vehicle commanders to duck inside and close the hatches, reducing their ability to spot more dangerous threats. Used extensively by the freedom fighters during the Hungarian Uprising of 1956 and the Prague Spring of 1968. One of these was used on Edinburgh's Princes Street (the main thoroughfare) by the notorious "Capital City Service" football hooligan firm, against the Aberdeen Casuals. The Casuals, hitherto known as one of the hardest firms in Scotland, turned and ran. Unfortunately for the CCS, this also marked the time when the law got really interested in football hooliganism, and organized hooliganism has been dying a slow death ever since. The jellied petroleum (or napalm) variant was pretty much the only anti-tank weapon the Bosnian Army had in it's early months- bonus points for getting a slightly charred tank for yourself after it cools off. A scaled-up version was used during World War II: Drop Tanks (externally-attached fuel tanks that could be discarded in-flight) were filled with jellied gasoline, then attached to an incendiary charge. These were then used as an Improvised Weapon when American personnel were short on bombs during the early pitched battles of the war (the preferred tactic was to drop them on unarmored Japanese supply ships and troop ships).